On Wednesday night May 3, 1972 promoter Ed Francis presented a wrestling card featuring a no disqualification match between Bobo Brazil and The Sheik. 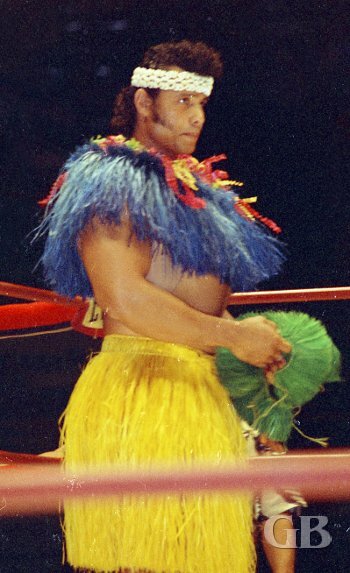 In the opening matches, Curtis Iaukea and Jimmy Snuka drew. Sam Steamboat defeated Tosh Togo, who filled in for Tarzan Tyler who was not available for the match. 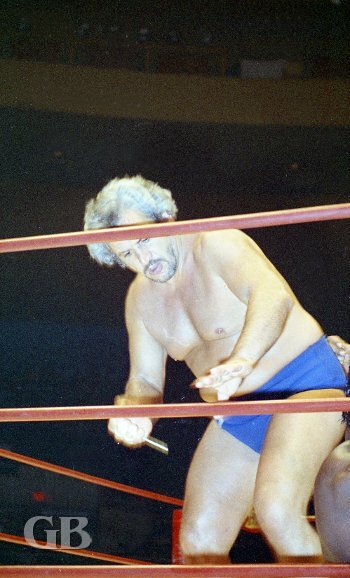 Ed Francis and Classy Freddie Blassie battled to a draw. A bare footed Tosh Togo subbed for Tarzon Tyler against Sam Steamboat. 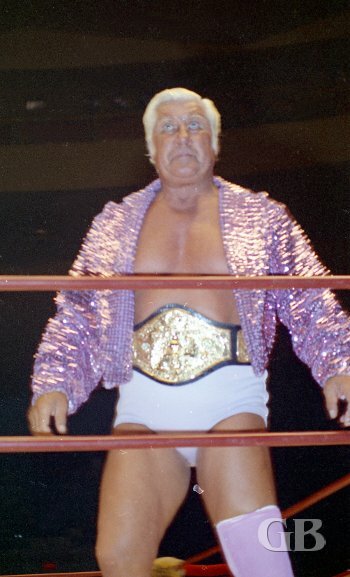 Blassie attacks Ed Francis with his signature move: biting. 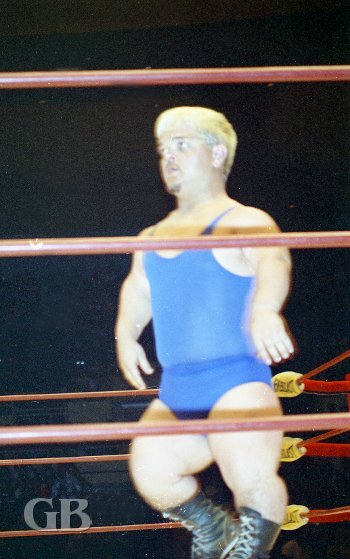 The next match was a midget tag team match. The team of Bobo Johnson & Cowboy Lang defeated the team of Little Bruiser & Little Crusher. Little Crusher clamps on a punishing head lock onto Bobo Johnson. 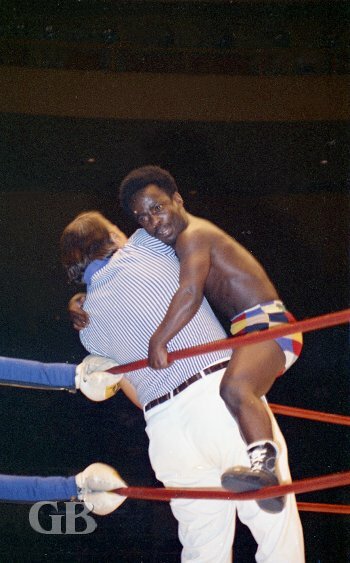 Bobo Johnson clinging to referee Pete Peterson. 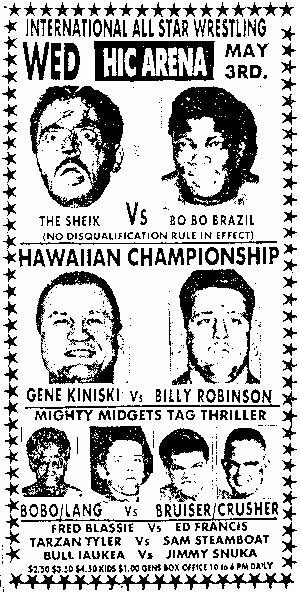 The first main event of the night was for the Hawaiian Championship with champion big Gene Kiniski going up against British challenger Billy Robinson. After a long, gruelling match, with both men matching hold for hold, ultimately time ran out. 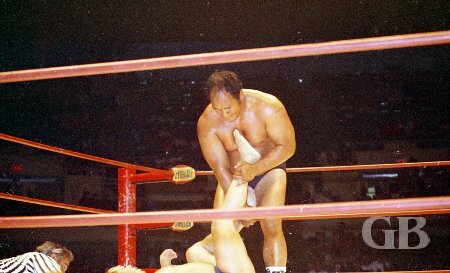 The match was declared a draw and Gene Kiniski retained his Hawaiian Championship Belt. Billy Robinson attempts to take down Gene Kiniski with an arm lock. 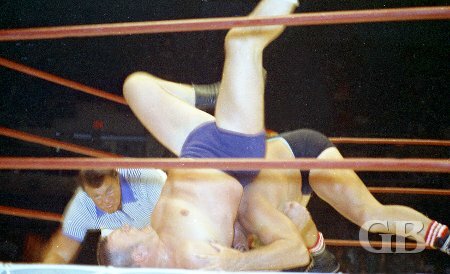 Billy Robinson readies a pin attempt on Gene Kiniski. The resulting pin attempt by Robinson. 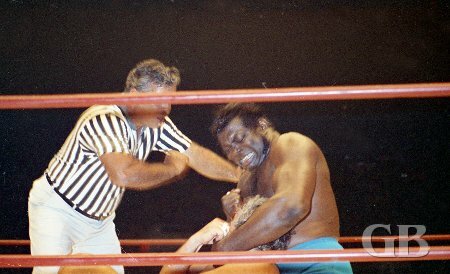 The main event was a bloody affair with Bobo Brazil vs The Sheik. The match was billed as a no disqualification match. Right from the opening bell the Sheik smuggled in a foreign object and used it against Brazil. Brazil turned the tables on the Sheik and using the object, ripped open the Sheik's head. With a no disqualification rule in effect, the referee was not able to interfere. The Sheik wields his metallicc foreign object. 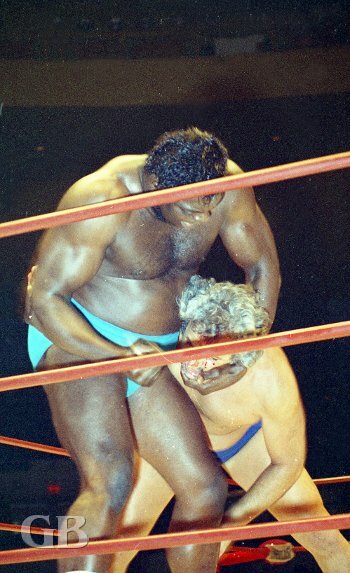 The Sheik chokes Bobo Brazil with the object. Bobo turns the tables on The Sheik. 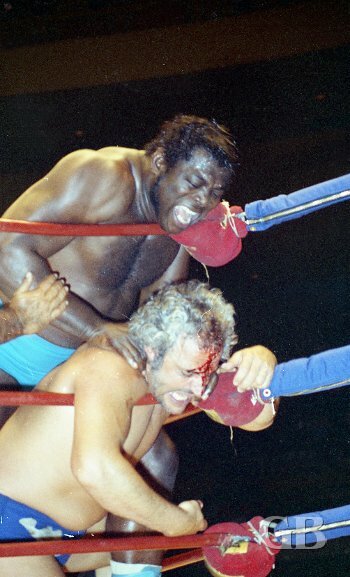 However, as the blood kept spewing all over the first row, the referee was forced to call the match when Bobo Brazil refused to stop his assault on the Sheik's head with the foreign object. 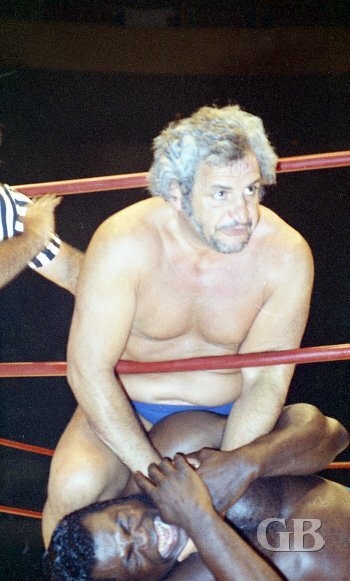 The Sheik was declared the winner as Bobo Brazil was disqualified in this no disqualification match. 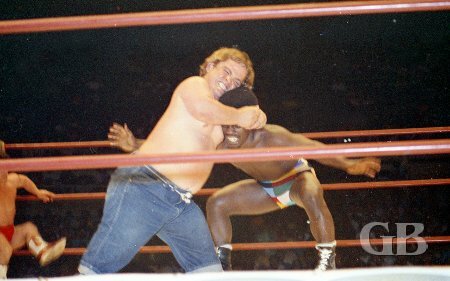 Bobo Brazil works over the Sheik in the corner. 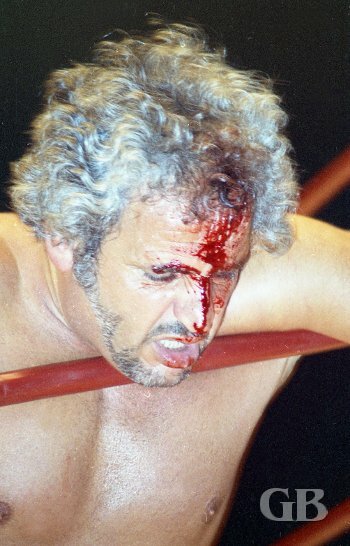 Bobo gouges away at the Sheik's forehead. The Sheik, a bloody mess.